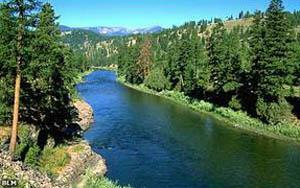 The Bitterroot river is our home stream and our activities are centered out of the beautiful Bitterroot Valley. We have 14 different float trips and many wade trip opportunities. The river is most known for its incredible dry fly fishing: its trout readily rising to dry fly even when there is no hatch in progress. The river is three streams in one, beginning high up in the valleys as a rocky tumbling small river. The middle reaches braid and meander, its character slowing into cut banks, deep pools and impressive runs. The lower river is very spring creek like, offer broad flats and runs were you can always cast to rising sippers. The Clark Fork of the Columbia is Montana’s largest river/ Seven different floats are offered on the river below Missoula, and two floats above Missoula. Upstream of Missoula it is a rocky braiding stream filled with mostly brown trout. Below Missoula it is a large trout stream of slickwater where pods of large rainbows wander in its seldom fished waters. This river has often been described as last great secret in the state of Montana. The Blackfoot is a scenic wonder cutting through dramatic canyons veiled in multicolored cliff walls. Eight years of special regulations have started to bring back quality trout fishing once again. It has a great early season salmon-fly hatch and fishes well in the August dog days. We have four different floats on the Blackfoot. The “Box Canyon” trip fast became a favorite with our clients. The Missouri is often described as Montana’s largest spring creek. Rising trout are dependable on the “Mighty Mo” from mid July through October. Impressive Trico and PMD hatches dominate.